Ask anyone in PR their thoughts on RFPs and they’re likely to recoil, their face turning ashen. Why would any firm want to respond to a cattle call pitting competitors against each other, when most of those competitors believe that the fix is in, the expectations are unrealistic, and the odds of winning don’t outweigh the chances of losing. And for clients, the RFP is like the proverbial hot potato: nobody wants to manage it, and everyone wants to toss it to a colleague. I am a shameless advocate for RFPs. Not just because RFPs are the foundation of my business. But because no one – on the agency or client side – has yet to develop a process better able to separate the wheat from the chaff. All that said, the RFP process works to the extent that the process is open, fair and balanced. Our premise has always been that the PR industry will be elevated if the agency selection process is a more structured, improved process. This is all predicated, though, on a level playing field and an earnest attempt by both sides to participate in an intelligent information and idea exchange with a serious and well-refereed interplay to yield not just a winner but a long-term relationship. This, in fact, is what we guarantee to our clients – leading, I’m happy to say, to satisfying results -- even for those agencies not selected. First, let’s recognize that the PR Council reports that 1/3 of all new agency business comes from RFPs. That’s substantial enough to take the process seriously no matter the size of your firm. The critical point, and where we take a very strong stand, is that there must be a standardized “bill of rights” for agencies and clients alike. Gone should be the sparse, two-page RFPs that prompt more questions than they answer, and that ask for the world in 10 days’ time. No RFP should hit the street that does not include a core scope of work and a budget; there’s simply no way to rationalize that agencies should propose a cost. And, all agencies – including any incumbents – should be on an equal ground at the start, with each having an equal shot at winning the client’s business. Bottom line: if an RFP does not follow these basic rules, agencies should reject it en masse. As we step into a new year, let’s build on the tenet that an agency search should be treated like hiring a new staff of senior- and mid-level employees. Think about it: bringing on a new agency with a budget of $250K, $500K or $1 million or more is like hiring a new public relations staff. Ask yourself: How long does that usually take? No staffer ever comes on board without presenting credentials, going through several rounds of interviews meeting existing staff, and being vetted through references, writing tests, and credit bureaus. It’s a process that typically takes you and HR three to six months -- yet most clients try to hire a new PR agency in four to six weeks. It’s irrational, considering you are hiring a firm to be the caretaker of your corporate reputation, and to serve as your organization’s external face. RFPs are pro forma in most industries. In public relations, we need to operate a bit differently. We should define the situation, provide context and background, and then outline what’s required. The devil is always in the details, and we at RFP Associates subscribe to more is best. The goal of each request should be to provide as much information as possible to allow an agency to offer their perspective, qualifications, and proposed plan of action to achieve your stated goals. Which means, in turn, that your RFP should be your blueprint for mutual success. Every agency search deserves a defined timeline that is clear to both sides. Cattle calling numerous agencies to respond does no party any good, and disrespects our industry. We advocate first pre-screening RFP recipient candidates through a request for qualifications (RFQ) as a means to uncover conflicts, true expertise, staffing, and (sometimes) locations. 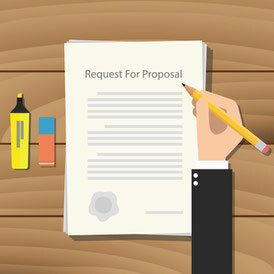 Choosing five to seven RFP recipient-contenders for your business is reasonable. And ending up with three or four finalists narrows the choice to a manageable level. Each successful, well-run agency search is a badge for the profession. The good work of our industry is evident in the Silver Anvils, Thoths (here in DC), Gold Quills, SABRE Awards, and more. And I would be willing to bet good money that many, if not most of those award-winning agencies were hired following a well-written and -organized RFP process. The Agency Search Process: Does It Drive Agency Satisfaction & Successful Outcomes? RFP Associates subscribes to and expects all the agencies we work with to adhere to the professional ethics codes outlined by at least one of the following: Public Relations Society of America, the PR Council and the Arthur Page Society.